Unsheathe your sword (stop sniggering at the back) and take a step back into a world of legend, knights and water-based ladies with the authentically Arthurian slot, Excalibur, from leading developer, NetEnt. 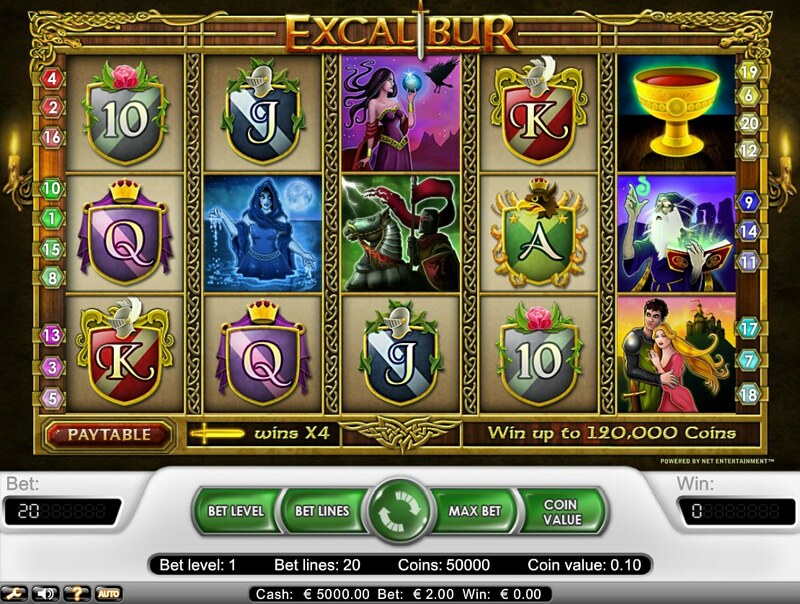 A 5-reel, 20-payline game, Excalibur takes its name from the legendary legend of the legendary King Arthur and his trusty sword, given to him by the mystical Lady of the Lake. The reels are filled as they are with plenty of relevant imagery like Arthur, his old man, Uther Pendragon, Morgan the evil witch, Merlin, the Black Knights, and Guinevere. Excalibur itself is there, of course, as are the traditional card symbols, here mounted on knights' shields. Meanwhile, in the background jolly minstrels play out some medieval fanfares whenever you hit a winning combo. The legendary sword in the stone is the key icon here, and actually appears on two symbols, both of which are Wild. The regular Wild appears on Reels 1, 2, 4 and 5, substituting all symbols other than the Scatter. It multiplies all winnings by two when it forms a winner. 'Tis but a scratch (Monty Python Holy Grail reference for you movie buffs out there!) compared to the golden Excalibur Wild, however, which only appears on the middle reel. Your wins there will be quadrupled if you're lucky enough to hit a winning combo it helps create. The Holy Grail icon, the great prize in Arthur's legendary quest, is the game's Scatter. You only need three or more Scatters anywhere on the reels to trigger the game's one bonus round - free spins. 10, 20 or 30 free spins can be won by hitting, respectively, 3, 4 or 5 Holy Grails. If you seek the Holy Grail of Arthurian slots, this gets pretty near. Pretty low in variance, with betting starting at just $0.01, the free spins round will never set the world on fire but a slight variation on Wilds is attractive enough. 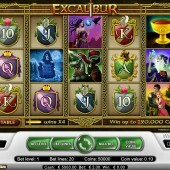 Excalibur is very similar in tone and feel to Microgaming's slice of Arthurian legend, the Avalon slot. For something a little quirkier, however, try the legend-themed slot, Unicorn Legend, from renowned slots developer, NextGen Gaming.